I’m thankful for rain as there have been too many years when there has been drought, so I hesitate to complain about too much rain, though excess of anything, even rain, can be bad. I am thankful that Southwest Tennessee, where we are now, has not had the severity of weather and related flooding this spring that places like Texas and Oklahoma have had. 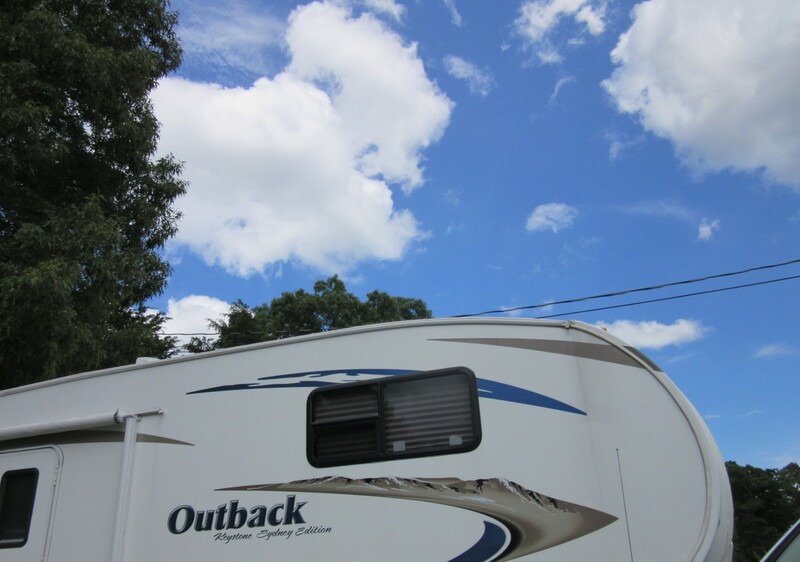 My biggest fear about living our current RV lifestyle is tornadoes and straight-line winds that are frequently a part of severe weather systems, especially in the spring. We have a weather radio that is programmed for where we are and is on all of the time, and we listen to forecasts and watch the skies (as well as we can surrounded by our beautiful green hills). With all of this said, I was watching the skies this past Sunday as a storm was heading in from the west-southwest. 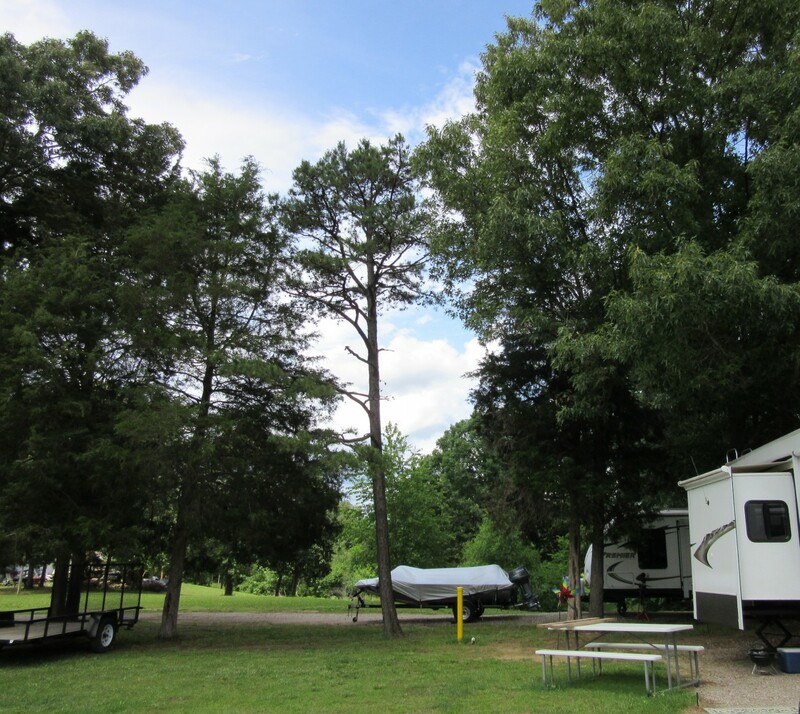 Our weather radio had informed us that Tennessee and Mississippi counties to our west and south were under flood warnings, but nothing severe was indicated for the county in which our current RV park is located. 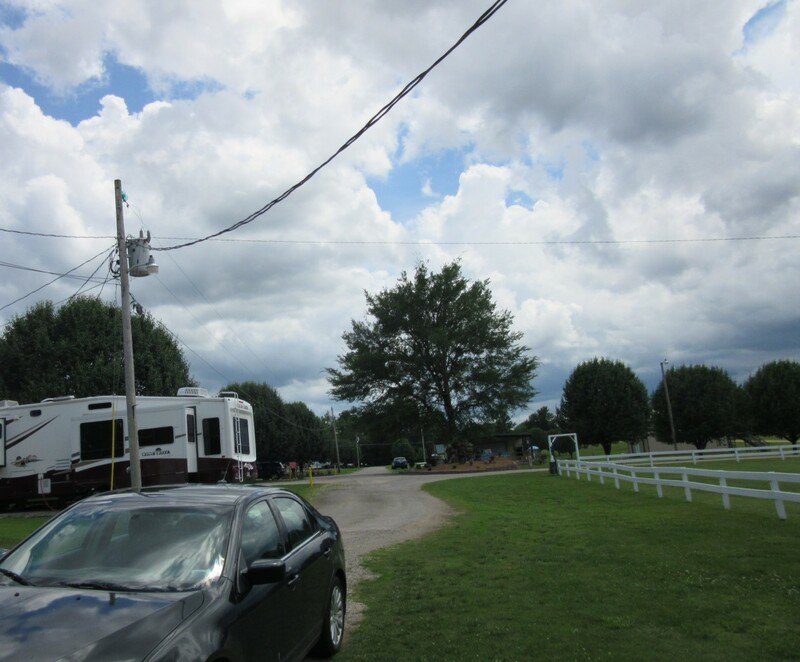 Still, I was watching the clouds closely because I had clothes hanging on our new bumper clothes line. Here is what I was seeing as I looked in all directions around our 5th wheel that day. These pictures were made in the same minute or two with me turning to face different directions as I snapped them. 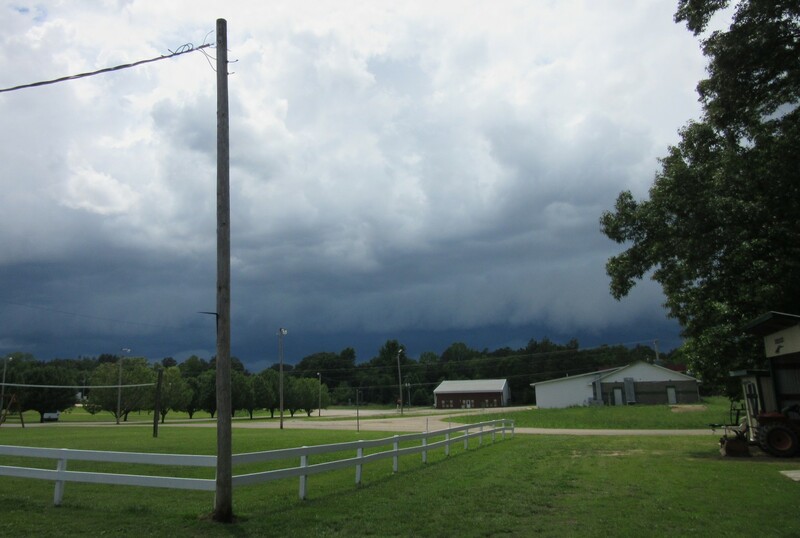 Growing up on a Tennessee farm before all of the latest technology, it was mainly from watching the signs in nature and the sky to the west and south that foretold what was coming, so I’m generally pretty good in daylight hours predicting weather. I had in my mind just how long I could let the two throws continue to dry before the first drops would fall. They were both so close to being dry, I wanted to give them every minute of breeze I could. When I decided I could wait no longer, I was so happy to find that both of the throws were dry. I had them inside with 4 or 5 minutes to spare before the first rain drops began to fall. Yes, it was a heavy rain, but there was no excessive wind, no hail, and a minimal about of thunder and lightning; it came in daylight hours, which I count a blessing since it is harder to make decisions when the severe weather comes under the cloak of darkness, often as we sleep. This weekend’s rain, though hard at times, was the kind of rain storms I’d rather have.